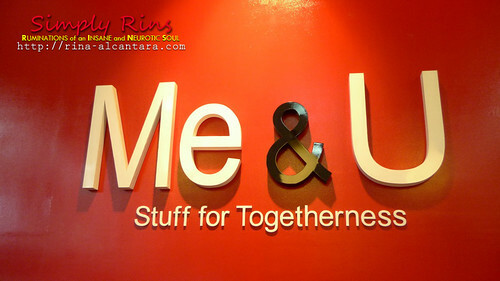 Shopping at "Me & U"
If your answer to both the questions is yes, I recommend you check out Me & U Shop: The Stuff For Togetherness! The store for couples! Me&U carries 3 brands: Human Touch, Propaganda, and Lovealot. There are several items to choose from. They have couple mugs, key chains, pillows, shirts, and a lot more. Me&U's main mission is to give you the best selection of international brands that offers eccentric or couple themed gifts that would suit any occassion. I particularly like the pillows, which Me & U categorized as the cheesy stuff! These pillow pictures were lifted from Me&U. It looks really small but actually, they're large. 2 pillows can fill the width of a queen size bed. As for me and my partner, we opted for the Human Touch couples shirt. Unlike other couples shirts, the designs from Human Touch are simple and classy. I really don't like those with "loud" layouts. We first used our shirts when we, together with my family, went on a road trip to visit the Aquino Museum and have lunch at Isdaan in Tarlac. All the designs come in pairs. You can't buy just one shirt. You can choose to buy shirts that have embossed design or those that are not. The latter is relatively cheaper. As of date, Me & U have 2 branches here in Manila. You can visit the store at Level 3 Eastwood Mall, Eastwood City or at Level 4 SM Megamall Atrium. Their pillows are really of great quality, plus the personalized design takes their products a notch higher. I love their couple shirts! Subtle mushy designs! Haha! I haven't tried their pillows.